D015680 Cross Westchester Expressway I-287 Exit 8E Reconstruction – KC Engineering and Land Surveying, P.C. The project scope for this interchange access improvement project included the reconstruction of Interchange 8E of I-287 Cross Westchester Expressway in the Town/Village of Harrison and City of White Plains, Westchester County. 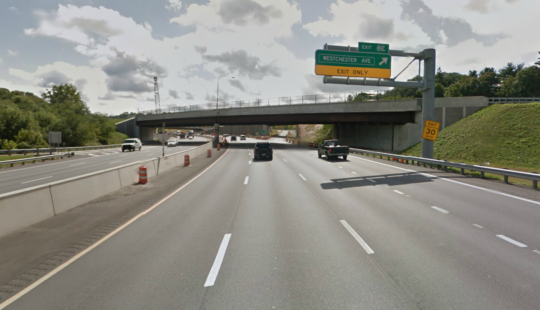 The project objectives were to provide an acceptable traffic flow and to minimize the potential for accidents in the Exit 8E Westchester Avenue/White Plains Avenue/Anderson Hill Road area. Preliminary bridge design (Phases I-IV) included bridge inspection/load rating, deck evaluation, fatigue evaluation, and seismic assessment. Final bridge design (Phases V-VI) included the preparation of bridge pre/final ADPs, pre/final plans, specifications, and estimates for 3 new bridges, 2 bridge replacements, 3 bridge rehabilitations, culvert extensions, and wing walls at Interchange 8E.